Five years ago today, I published my first article here on Curbside Classic. The subject was the Holden Camira, Australia’s version of the GM J-Car. 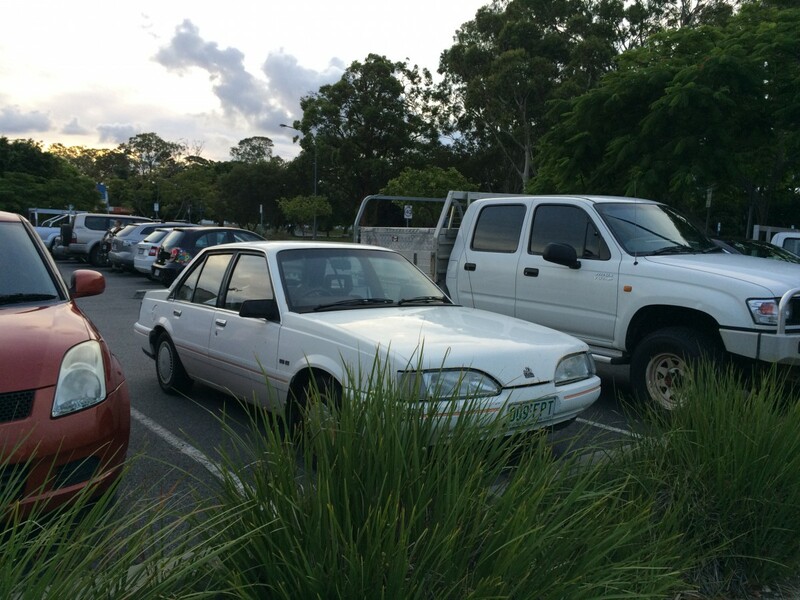 I couldn’t believe it… I had found a site where I could write about something as mundane as a Holden Camira, and people would actually read my work. Even comment on it! What was this amazing site? Looking back, that article was a bit rough. My writing wasn’t as succinct then as it is now. My photographs were abysmal. And calling the Camira “short-lived” was a misnomer when it was sold for as long as almost every J-Car outside of the Americas. But Paul allowed me to share that piece as he’s allowed so many contributors to do, and he gave me feedback and helped me develop my writing skills. For that, I’ll always be grateful. Fun fact: the only time I’ve ever been called out by a stranger for photographing a Curbside Classic was when I shot this red Camira. And seriously, an article on a Camira? You’ve really gotta be impressed by this site, that such mundane cars can enjoy their moment in the spotlight. I’ve written about cars as humdrum as the Daewoo Nubira and the Daihatsu Applause. It’s remarkable, really. The Camira may not be in anybody’s dream car garage but it is a crucial part of the Holden story. So, did I miss anything last time? Getting involved in the J-Car project allowed Holden to bring to market their first front-wheel-drive vehicle and their most advanced car yet. Despite its only engine being a small OHC 1.6 four-cylinder, the Camira produced about as much power as the 2.0 fours in rival, rear-wheel-drive Japanese rivals, if less torque, while weighing less and boasting superior packaging. Automotive journalists also raved about the car’s excellent dynamics, especially when compared with its often stodgy, old-tech rivals. One of the criticisms levelled at the Camira, however, was the lack of torque from the 1.6. Like many of GM’s questionable business decisions in the 1980s, the 1.6 was locked in when fuel prices were through the roof and another oil crisis seemed a foregone conclusion. Although Holden exported the 1.6 around the world, the plant encountered heavy losses and ran at only 60% capacity some years. This was a further thorn in Holden’s side as they endured a rocky 1980s, then setting the record for the largest losses of an Australian company—that expensive new engine plant certainly didn’t help the balance sheets. Market share had nosedived from 28% in 1979 to just 18% in 1983, while the Japanese nearly doubled their market share during that time. Fuel prices had fallen back to earth, the anticipated V8 extinction event never happened, and bigger engines (and bigger cars) were popular again. This was arguably the beginning of the end of the mid-size segment in Australia. While cars like the Camira, Toyota Corona, Nissan Bluebird and Mitsubishi Sigma were consistently top 10 sellers, the following decade would see this segment decimated by larger and increasingly comfortable compacts from below and the perennially popular Commodore and Falcon from above. The revised JD Camira of 1984 received a larger, fuel-injected Family II 1.8 with 28 more horsepower and 8 more pound-feet of torque, just as Australia was about to switch to unleaded petrol. This brought the Camira back to square one, effectively—the Camira switched back to a carbureter and lost all 28 of its extra horses and most of its extra torque. Ouch. Fortunately, the JE series of 1987 brought a still-larger engine – a fuel-injected 2.0, finally – which restored those missing horses to the Camira while giving a hearty bump in torque (up to 130 ft-lbs). Still boasting a relatively light curb weight (2400 lbs), the Camira was once again quite zippy and could hit 60mph in around 10 seconds. For all the hullabaloo about the J-Car platform being a “world car”, there was little enthusiasm within GM to do it all again. Isuzu and Opel/Vauxhall went their separate ways, leaving Holden with no affordable way to develop a replacement Camira. That is, until Holden and Toyota entered into a joint venture. Camira came and went and Apollo landed in Australia, a Camry with different badging and lights. It sold worse than the Camira, shifting around 5500 annual units. Holden had originally considered calling it Camira and perhaps it should have as, for better or worse, that badge had name recognition. Although early Camiras encountered issues with headgaskets and smoky engines, those issues were largely resolved over the years. Alas, that lingering reputation of poor quality remains—whether the Camira was built any worse than other Aussie cars is debatable, although it’s interesting how Toyota topped the quality charts even with its Aussie-built models. Some companies simply have a greater dedication to quality control. The European versions of the J-Car had become overnight successes, while the Camira’s story had many parallels with the American J-Car. Both initially failed to meet ambitious sales projections. Both deviated from the European J-Cars in terms of suspension design (the Camira used an adapted RWD T-Car rear suspension). Both initially featured underwhelming engines. Neither developed an especially credible reputation for quality or reliability. The similarities end there, however. While the Cavalier was repositioned and saw its sales take off, the Camira faltered on the market. In 1983, Holden sold 33,193 of them. Just three years later, that number was down to 10,377. At launch, Holden anticipated the Camira could become their best-selling car in an increasingly economy-conscious market. It never did. But it wasn’t all doom and gloom for Holden as, despite the disappointing sales performance of the Camira and its successor, Holden managed to reverse its market share slide. It was true five years ago and it’s still true today: it’s much more interesting to write about a car that didn’t meet its creator’s expectations. For that reason, it’s been strangely thrilling to write about cars like the FAW F1, Fiat Regata, and the Nissan Pintara. I’ll leave the Ferrari and Lamborghini articles to those who can truly do them justice. Thank you, Paul, for affording me the purview to write about the disappointing, the obscure, the forgettable, and the forgotten. On what other website can you find two articles about the Holden Camira? So I was starting to think up something about how low it is in a modern context like the white JD parked next to a Suzuki Swift, or the JB wagon parked next to a gen 9 Corolla in your original article. Then you hit me with the JE parked next to a 4th gen Accord and it’s lower than *that* – and the Accords of that era seemed like low cars *in their time*… something I never thought was the case with J-cars. I know what you mean about going back and looking at early submissions. Oy! This is the first time I have looked closely enough to notice the way stylists disguised that distinctive kink in the original J car’s C pillar. I can’t decide if I like it, bu it certainly changes the car’s look. DLO fail! See also: the old Lincoln MKZ. Was gonna post the same thing. Is this the earliest DLO fail?? It might still be a prosaic J-car but I think the big headlights on the later Camira would have looked pretty neat on the US Cavalier. The “eggcrate” taillights on the red sedan are sort of intriguing too. To all the contributors to CC, let me first say I highly enjoy reading about cars from other parts of the world. And I really enjoy it when the articles have links to “related” vehicles. And secondly, it isn’t all that often I get to read about a car that is “cousin” to one I once owned : a Pontiac J2000. Looking at some of the photos, it appears as though the Holden stylists used a few of the Pontiac’s design cues. At one point Pontiac used headlights that completely filled the grille openings, so that it looks vaguely similar to the Camira, and the tailights with that black cross-hatch pattern were used for “a bit” on one of the J2000/Sunbird updates. My J car had the same wheezy 2 liter OHV engine many of the early J cars in the U. S. used, I can imagine it was similar to the 1.6 used in Australia when it came to driving “dynamics”. One small quibble with the article, no pictures of the interior? Watch the rather embarrassing ad. You see the full interior of the top line model, quite stylish in the day. Didn’t watch the video but Google Imaged the Camira. It looks like there were 2 or 3 different dashboard treatments? The ones pictured looked like they were Japanese-inspired. I was expecting yet another variation of the instrument panel used in the Chevy Cavalier. It would have been nice to see the Holden dashboard in a Cavalier or Sunbird. Perhaps that would have nudged GMNA towards import-flavored interiors that much sooner. Happy CC Anniversary! I remember reading the Camira article shortly after I discovered CC, and thinking “I never knew that car existed” — and I was soon captivated by a site that publishes interesting articles on topics like J cars. Keep up the great work; I always enjoy your articles. Thanks Eric, I always enjoy yours! Happy anniversary, William! You often bring to the fore cars that I am au fait with – this j-car variant seems to blend elements of the European Cavalier with the Isuzu Aska in terms of its styling, with the earlier ones looking more like their European siblings. These were so much better than the competition when new, proper Euro handling at last, practically as roomy as the Commodore, and a rev happy engine too. No wonder the press loved it, an Alfa for the masses. And then the wheels fell off it – literally, for that became yet another failing by the end (steering knuckles, to be accurate). It was indeed like an Alfa; to own, as well as drive. Every one of them had smoky engines at low mileage, all eventually got rusty firewalls and leaked, and all had dashboard failings. All had sub-ordinary gearbags, and the popular autos simply had no power whatsoever. I’ve never known a new car to provoke such universal dislike from it’s owners. The JD fixed the power issue on upper models with the 1.8 multipoint, but wrapped it in amatuerish styling update that no-one liked. Then, unleaded, it lost all the power, though it did stay injected, albeit single point. The final JE fixed up the styling to an acceptable extent, and was outright quick in the day for the market it was in. Retained the gearbag, though. I’ve driven many miles in JB’s and JE’s, and the latter particularly was a good car for the open road. Low wind noise, good seats, good ride. The really fine handling made even the underpowered JB a car that you wound up in the crazily high 5th, without any need to back off. But in town, no fun at all. Aussie cars weren’t quality products at the time, but this was the worst of them. Someone loyally buying a midsize Holden automatic wagon “Suercar” had no way of knowing that the COTY had been given specifically only to the manual four speed sedan (the four speed shift was ok). Rather than the rear-steerable, revvy handling delight that Wheels magazine loved, they got a really unreliable, really weak-chested pile of crap. Many never bought a Holden again. Even though I personally have a soft spot for them, GM fully deserved the failure that they got, and the ignominy the name carried for years after. Do you know, William, if I ever get round to finishing a COAL, the Camira just might get a THIRD go on CC! Only here. Justy, I would LOVE to read that COAL. A mate of mine shared his Camira experience with me last night. Sounds much like yours. Photo #1…. almost thought this was an article about someone’s attempt to develop a four door version of a 1989 Mustang. Very interesting article; I also never even knew this car existed before CC. Nicely done. It’s curious how some styling details seem to repeat: that front end has a definite Mustang/early Infiniti Q45 feel to it. I like the first Camira, it’s snout is very seemed to the one of the Isuzu Aska and has that plus in length that lacks in the short nose of the Opel Ascona. Indeed almost all divisions of GM which used Opel cars ended up elongating their noses. Holden team also give more harmony in the Opel Senator design with the long nose of the Commodore VN. If there was a J-Car for Saturn, it would have the second Camira nose for sure. Looks nicer than the J-car junk we got here in NA but apparently these Holdens had lots of quality issues too. Congratulations Will! Five years already; seems like only yesterday. And yes, your writing has made leaps and bounds; you’re a rel pro, and have been for some time. And you’ve become one of the CC stalwarts. Than you for helping to make what CC is today. I’d say you’ve played a big role in all of the following CC has in Australia. Yes, the Australian J car does seem to have had a somewhat similar trajectory as in the US. The difference was is that in the US, GM HAD to keep cranking them out at big volumes, to meet CAFE regs, as an offset to all the trucks and SUVs. So GM juts lowered the price to whatever it took to keep selling them, even at a loss. Obviously Holden was in no position to do that, or need to do that. The J car was GM’s last chance to compete in the small car market, and they totally blew it. Yes, they kept cranking them out in the US at a loss, but the J car is what has led to GM being only a bit payer in this segment, and who knows for how much longer at all. Trucks Uber Alles!! Thanks Paul! Your words mean so much to me. I’m honoured to be one of the stalwarts here and I intend to keep on crankin’ out articles. As much as I love to write about cars in the American market, I also love sharing Australian stories (like this Camira one) with an international audience–I’m sure Don and John would say the same! That this site can be such a broad tent is so remarkable about CC. Other automotive sites tend to be very much grounded in one market and any international articles tend to be just an occasional special feature, whereas we have a pretty constant grind of British, Canadian, Brazilian and Aussie articles, among others. I love this site. Isn’t it fun to revisit cars we wrote about years ago now?! As usual, great article Will, and glad to have you here! That red JE Camira with the body kit and geometric taillights is probably one of the best looking 4-door J-cars I’ve ever seen. Those wheels, the stance, and that a$$ really is a looker. I’m not particularly a fan of the front end, but with how interchangeable the front ends are I’d slap on the semi-hidden headlight front from a Pontiac Sunbird GT. That’d make a pretty good looking little sedan. Only the US J-cars had fully interchangeable Endura front ends; Camiras along with Isuzu Askas and Opel Ascona/Vauxhall Cavaliers had their own fenders and hoods that met the grilles and light clusters directly. You’d need to either swap over all the outer sheetmetal ahead of the firewall (with no guarantees of fit) or do some cutting and shutting. For that matter, that meant the JD Camira facelift cost Holden a lot more than it would’ve if they’d just gone with the American cars’ flat-leading-edged fenders/hood and full plastic nosecone. I hired a 2.0 Camira wagon for my last week in Tassie it was an elcheapo rental an automatic and quite horrible, I can easily understand why there are none left. I assume there wasn’t a 5-door Hatch version in Australia; I know Vauxhall imported the Camira Estate panels to make Cavalier Estates (similar looking, but different to the American J Wagon). The Cavalier updates here were rather less adventurous, just new grilles and patterning on the (same shape) rear lights, plus full-width tail trim. When the JB Camira launched, the buff books reported the 5-door hatch would be forthcoming. Alas, it never eventuated. I don’t know if it would have helped sales, even if the Camira had been better-built: a segment below, you suffered (from the 80s onwards) if you didn’t have a hatch. A segment above, nobody expected a hatch. The mid-size segment? Camry did well without a hatch from its second-generation, but Mazda continued to offer a hatch for years. Etc etc. I too love CC for the pieces on obscure cars, thanks William. Most of the obscurities I’ve had no direct experience with, but not so with the Camira…extensive exposure to a then new JD 4 speed wagon, usually in dense city traffic, confirms the accuracy of Justy’s view. Happy anniversary Will and thank you for all your contributions to my favorite web site of all time. That goes for all the contributors and especially Paul. This website is a part of my life everyday. I have certain times during the day that I read CC without fail. (Every time I’m in my small office with the porcelain throne being one.) I remember when I found CC years ago and was so shocked and excited to see that there was a place dedicated to the love of such “special cars”. People don’t get me. My friends and family can’t understand why in the world I’m such a fan of such “crap cars”. Well I don’t understand myself either but it’s so nice to see that I’m not alone and to have a place to get my daily fill of what I dream of owning. Yes, I love muscle cars, and I love new cars, and I dream of owning a new Mercedes S500, but my dream garage, the one I wish I could fill, would have such gems as a 1985 K car, Buick Roadmaster wagons, 1977-1990 B body wagons and sedans from all 4 divisions, Ford LTD’s, Fleetwoods, Century wagons, and on and on. So thank you All for your hard work keeping us entertained. I just wish I was a better writer and could be a contributor someday. Happy anniversary Will. Always a pleasure to read your articles, even about Camiras! One aspect nobody has touched on is how quickly most of them seemed to disappear from the roads. There seemed to be an initial spurt of popularity, followed by a mass disappearance. Throughout the eighties they were never as common in Melbourne as the arch-rival Ford Telstar which somehow had the perception of being a bigger car. But then the Ford had a ‘full-size” (for the class) 2.0 litre engine. The Camira’s 1.6 made it seem more like a Gemini replacement than a mid-sizer, whatever the ads might say. I saw my first JD while on honeymoon in 1984, and was amazed. The big headlights and grille-less nose made it look rather like a Citroen, I thought. The next thought was – ‘They’re facelifting the Camira already?’. It seemed too early for such a drastic (and expensive) re-do. Must have been trouble somewhere to prompt Holden to do that so early in the car’s life. In 1987 I returned to college, where one of my new friends had a JB wagon. That stood out because Camira wagons weren’t a common sight anyway, and because it was a JB. Even then, they were becoming an unusual sight. Holden has never been strong in the mid-size class since about the mid-seventies, when the LJ Torana ballooned into the LH. Well done finding these still on the road. Congratulations Will. One of the things I enjoy about CC is the articles from outside North America and what car life is like. Fancy exotics I can read about in coffee table books but CC lets me learn about real people and the real cars they drive! Here’s to another five years! What a weird name for a car (Camira? Chimera? )… Funny how GM only really got traction with these in Europe. But then Japanese competition was weaker there than it already was in Oz pr the US. Wasn’t the Camira supposed the Mitsubishi Sigma killer? I was always under the impression the Camira was closely aligned with the Isuzu Aska in certain regards. It appears that really isn’t the case until later in the cars life regarding the interior and rear window design. That said, I find the Aska to be the superior J-car of the whole lot. Isuzu motors, cleaner style, optional clutchless NAVi-5 manual transmission, and likely the sportiest J-car of all; the Irmscher. 150 PS and 167 LB from Isuzu’s Turbo 4ZC1-T motor, and very aggressive suspension setup from said acclaimed German tuning house known for making very fast Opels. This was the Brit J car, the Vauxhall cavalier. It sold by the boatload here, it was the quintessential ’80s company car. when it was launched all the big fleets went Vauxhall and abandoned Ford in droves. It really was pretty advanced for 1981, even the 1300 version was quite spritely. It was the same in Brazil. The Chevrolet Monza was so popular that even the Vectra A couldn’t fully replace it, because of that GM only made the Vectra B in CKD from 1993 to 1995. In 1991 our J-car received the last update and continued as one of the best seller GM along the 90’s, when the Vectra B production started in 1996, definitely replacing the Monza. I love how the Monza (first one and the “Tubarão” One), Vectra B and Omega A (and to a lesser extent, the Astra G) were considered stellar cars in Brazil, the last cars representing an era when GM vehicles were some of the best cars you could buy there. Everything fell apart when the franken-Astra (Astra H with G electronics, a 1990s engine and the Vectra name) replaced the Vectra B. In the UK the last (Mk.III) Cavalier was the same car as the Vectra A but did very well. It was the Vectra B that slipped in the sales charts; mind Ford’s Mondeo did up the game considerably. Believe it or not my Opel Monza (made in Italy, assembled in South Africa) convertible would make 120 MPH on t he high-veld with the 2.0 litre “babyboss” engine. CC effect; no I havent seen a Camira recently but if anyone checks wiki about them the Isuzu Aska rebadge NZ only model is mentioned and has a photo with it of my father’s car gleaned from the CC cohort and reproduced with my permission. Yes they do ask. I’ve only been reading here for 3 years (commenting for 1 and 1/2), but always enjoyed your articles a lot. As do many CCers, I also have a soft spot for Aussie cars (particularly the BA Falcon, VE Commodore and the last Monaro), and do wish I saw at least one here in Portugal. It’s very sad the Australian Auto industry came to this point, but at least, it died a hero, and built amazing cars. Last one I saw was in the 90s. At Sandgate Pool. The manager drove it. A 2 litre wagon. The ultimate Camira. I thought that was pretty cool. First one I saw was out the front of Eagers Newstead offices. A base JB with a price on it. Used to check my bankbook regularly to see if I had enough.